Hunt the Thimble (also known as Hide the Thimble) is a party game in which one person hides a thimble, or other small object, somewhere in the room, while all other players wait outside. (In some versions of the game, it must be hidden in plain sight.) When everyone comes back in, they race to locate the hidden object. The first to find it is the winner, and hides it for the next game. In some versions of the game, the hider tell the searchers what "temperature" they are based on proximity to the hidden object—the closer they get, the hotter they are; thus, the farther they are from the object, the colder they are. Other variations involve only one person leaving the room and everybody else hiding the object. 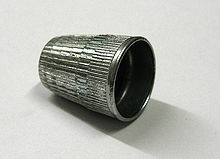 In Singing Hunt the Thimble, the hiders sing louder when the searcher is close to the object and softer when they are farther away. Similar games exist in Germany (Topfschlagen, in which a blindfolded player must find a pot guided by calls of hot or cold ); in Poland (Ciepło-zimno) and in Russia (Kholodno-goryacho, both meaning Hot & Cold). In the Polish and Russian version a player is guided to find a hidden object by calls of cold, colder, warm, hot, boiling; blindfold is not used. The game exists also in Spanish speaking countries. ^ Family Fun & Games. Sterling Publishing Company. 1994. p. 246. ISBN 9780806987774. ^ a b c d Welsch, Roger L. (1984). A Treasury of Nebraska Pioneer Folklore. U of Nebraska Press. p. 300. ISBN 9780803297074. This page was last edited on 10 April 2019, at 11:13 (UTC).